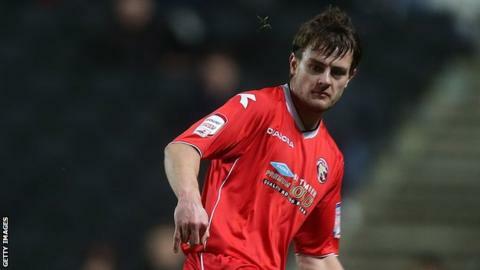 Walsall maintained their unbeaten start to the season as second-half goals from Andy Taylor and Sam Mantom condemned Rochdale to a first defeat. The Saddlers took the lead as a swift counter-attack saw Taylor volley home Milan Lalkovic's cross. Mantom doubled the visitors' lead at Spotland as his deflected shot looped over goalkeeper Josh Lillis. Dale claimed a consolation as Ian Henderson's header rattled the bar but Calvin Andrew netted from the rebound. "It was a good game to watch and a great result because you know you've got a tough game when you come to Rochdale. "They don't give you any respite and you have to work hard for everything you get here. "We're showing a lot of character and resilience at the moment." Match ends, Rochdale 1, Walsall 2. Second Half ends, Rochdale 1, Walsall 2. Corner, Rochdale. Conceded by Paul Downing. Goal! Rochdale 1, Walsall 2. Calvin Andrew (Rochdale) header from the centre of the box to the bottom left corner. Substitution, Walsall. Rico Henry replaces Andy Taylor because of an injury. Goal! Rochdale 0, Walsall 2. Sam Mantom (Walsall) right footed shot from outside the box to the top right corner. Jason Demetriou (Walsall) wins a free kick on the left wing. Attempt saved. Tom Bradshaw (Walsall) left footed shot from the centre of the box is saved in the centre of the goal. Attempt saved. Donal McDermott (Rochdale) right footed shot from outside the box is saved in the top centre of the goal. Substitution, Walsall. Romaine Sawyers replaces Milan Lalkovic. Substitution, Walsall. Anthony Forde replaces Reece Flanagan. Goal! Rochdale 0, Walsall 1. Andy Taylor (Walsall) left footed shot from the centre of the box to the centre of the goal. Assisted by Milan Lalkovic. Attempt saved. Joe Bunney (Rochdale) right footed shot from outside the box is saved in the top centre of the goal. Attempt saved. Joe Bunney (Rochdale) right footed shot from outside the box is saved in the bottom left corner. Corner, Rochdale. Conceded by Neil Etheridge. Attempt saved. Reece Flanagan (Walsall) right footed shot from outside the box is saved in the top centre of the goal. Donal McDermott (Rochdale) wins a free kick in the attacking half. Attempt missed. Kieron Morris (Walsall) right footed shot from the right side of the six yard box is close, but misses to the right. Corner, Walsall. Conceded by Oliver Lancashire. Substitution, Rochdale. Joe Bunney replaces Joseph Rafferty. Adam Chambers (Walsall) wins a free kick on the right wing.